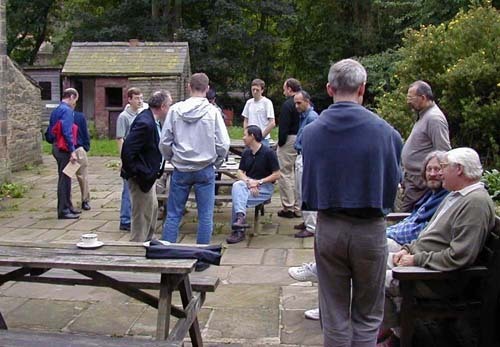 Visitors to the Forge are always offered a guided tour of the restored forge and of the Industrial Museum. There will be no further charge other than the normal entry fee to the grounds. In this way, visitors will see all of our working exhibits being operated. It would be a bit boring to wander round stuff that just sits there! Our Guide performs a circular tour of the site and will operate most of our working exhibits on the way round. He or she then starts all over again after drawing breath. Visitors can join the tour at any stage. 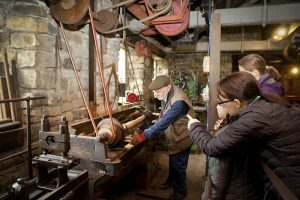 A visitor is likely to find out how iron was made and history of the iron industry in South Yorkshire. The history of the Forge and its forgemasters will get a mention. Our collection of working machine tools will be demonstrated. Our collection of stationary steam engines will be operated, but driven by compressed air rather than by steam. In the workers’ cottages one can see the very physical lifestyle of the 1900s. The Yorkshire range would need blackleading, washing involved the copper, peggy tubs and the mangle, the tin bath hangs on a nail outside and torn up newspaper hangs in the privy across the yard. It usually takes about 90 minutes to complete the circuit. A Sunday visitor to Top Forge in the autumn has used his video camera to good effect. Mr Gregos Jezewski has sent us three You-tube references for Christmas.